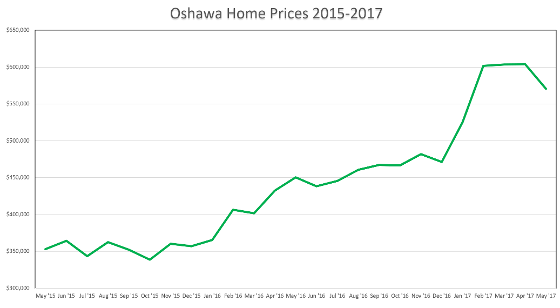 The Oshawa real estate market has finally found some inventory to help temper the demand that seemed insatiable just a few months ago. It posted a much more modest 17.0% average annual price gain in May 2017. The Toronto Real Estate Board's (TREB) latest market statistics show the average Oshawa property at $526,774 - up from last year's 450,220. Sales volume, however, was down 15.2% with 347 units sold versus 409 last May. The average selling price of homes in the GTA this May was $863,910. This represents a 14.9% increase over 2016. Sales volume was down 20.8% and new listings shot up 48.9% from last year. Active listings within the board increased 42.9%, which shows a shift in market fundamentals. The jump in inventory is helping to make the market more balanced - more inventory means less bidding wars as supply rises. 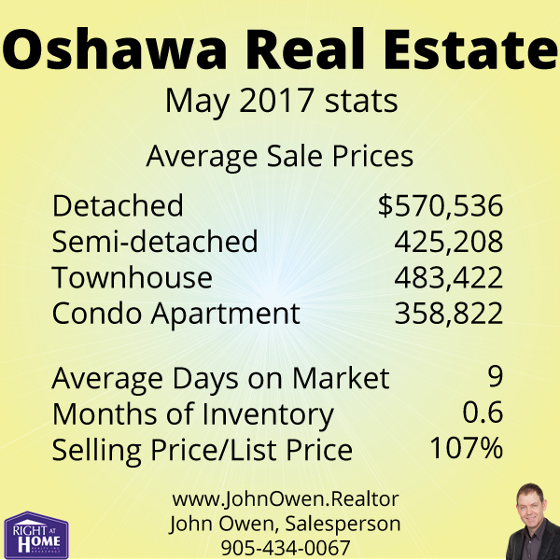 In Oshawa, the increase was much more pronounced - up 203.3% with 555 active listings over 183 last year. This helps to explain why prices dropped from April levels. The increase wasn't nearly enough to make it a buyer's market, though. The average property in Oshawa still sold for 107% of asking. That's still better than the entire GTA - at 104%, and is partly due to Oshawa still having the lowest average prices in the market. While inventory levels did increase, the levels are still low. The current trend shows only 0.6 months of inventory. Part of the reason that active listings numbers are showing so high versus units sold is the high number of listings that have been terminated, then re-listed with a higher asking price. It seems counterintuitive to take a home off the market and then put it back up at a higher price, but that is what is happening. There are many agents out there that have stragegized listing at a low price to incite a bidding frenzy and then get caught when it doesn't materialize on offer day. Of course, the sellers didn't really plan to sell at the asking price, so they end up terminating the listing, then posting it as "new". The problem here is that nobody gets fooled as the terminated listing is still in the system, and the agent has egg on their face trying to explain the situation. I would like to see this process outlawed by the boards. If someone decides to change asking price, they should be forced to show it in the system as a price change, and not as a new listing (provided they are still with the same brokerage, of course). This would help to make the market statistics more accurate, and to make the listing itself more transparent on changes and days that it has been on the market. The MLS Home Price Index helps to normalize the statistics, by adjusting sales statistics to represent typical homes within MLS areas. 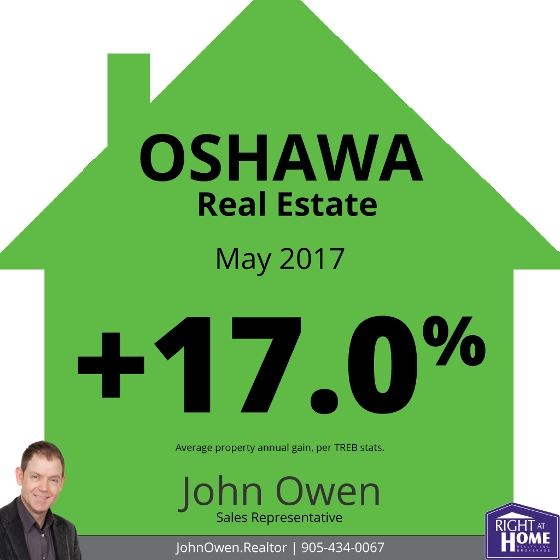 When using these numbers, Oshawa showed a composite annual gain of 37.9%, compared to the TREB average of 29%. Inventory levels continue at very low levels with 1.1 months of inventory on hand across the board. This means that a current sales levels, all of the property would be bought up in the GTA in 1.1 months (if no new listings were added). Many areas within the GTA have similar figures, but unsurprisingly to those who read my reports, Durham Region still has the lowest inventory in the entire area. Overall, there is only 0.7 months inventory in the area. In Oshawa, there is just 0.6 months inventory. Many home prices and types are experiencing bidding wars. The average listing in Oshawa spent 9 days on the market. The TREB average was 11 days.